Lathrop Manor loves the holidays. The house is happiest when there are people in every room and at least three fireplaces are lit. However, we need more sofas for the post-Turkey syndrome. 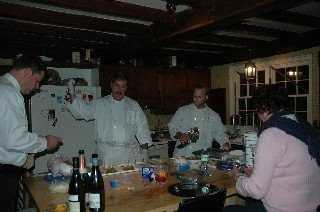 On Sunday, November 2, 2008, Lathrop Manor hosted a dinner donated to the Rotary Charity Auction. Eight guests enjoyed culinary specialties from Chefs Marco Middleton and Joe Kubik with Maitre'd Bill Middleton and Sous Chef Robin. And of course, many thanks to additional Sous Chefs Sue and Ray, who were unable to attend the Main Event. As well as Stan, our generous sponsor.